1x SP RHINESTONE DRAGONFLY DANGLE CHARM BEAD. 1x SILVER PLATED VIOLET AND LIGHT PURPLE RHINESTONE DRAGONFLY DANGLE CHARM BEAD. You are bidding on 1x Silver Plated Violet And Light Purple Dragonfly Dangle Charm Bead With 4 Violet Rhinestones On The Wings And 3 Light Purple Rhinestones On The Body. This Dangle Charm Bead Has A Texture Pattern On The Back For European Style Charm Bracelets Or Necklaces. A Lovely Looking Dangle Charm Bead. 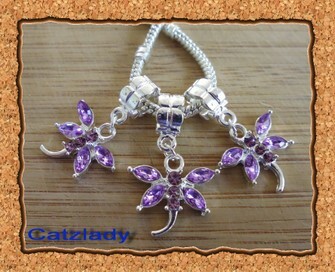 Colour: Silver Plated And 4 Violet And # Light Purple Rhinestones. Size: Approx 31mm x 20mm. Will Fit: All Other European Style Charm Bracelets And Necklaces. IT IS THE ACTUAL CHARM BEAD TAKEN BY MY CAMERA. THE PHOTO OF THE BEAD HAS BEEN ENLARGED.